Mr B was so excited to be finally driving his very own Cadillac, he chalked up 2,000 kms in 4 weeks! 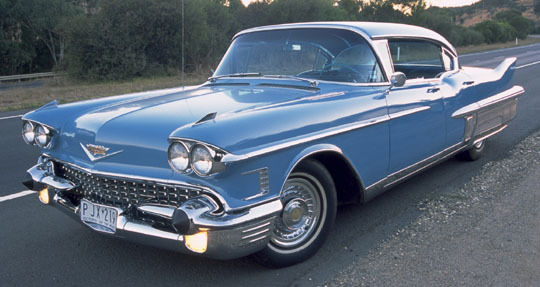 14 years wait for a 1958.....Mr B shares his experience of buying a Caddy. After over 14 years in the club Caddyless, the bullet has finally been bitten. Some things take forever, it has taken me so long to buy a Cadillac that most of my friends in the club had given up believing it would ever happen. Since I was young Cadillacs have been the pinnacle of my automotive dreams, the one that really got me was the 1958 Fleetwood. So why did it take so long? Cash, timing and stupidity. 1. Cash? I'm the world's worst saver. 2. Timing? When I didn't have the money great cars would arise and of course vice versa. 3. Stupidity? When I did have the money and couldn't find a Caddy straight away I'd get anxious and buy some other car, which of course was always a bomb and I'd blow lots of cash on and put myself right back where I started. Oh well. In January Lorraine Morris mentioned a 58 that was unrestored at a fairly good price which got the clock ticking. I talked to my wife and started looking into this option. All the while lurking in the back of my mind was a blue 1958 Fleetwood in fairly good order, not needing a full resto I'd seen in Unique Cars. Roslyn and I flew to Europe for a friend's wedding, whilst there I got a call from a Japanese client wanting me to photograph the Melbourne Grand Prix. Guess which city the Fleetwood was in? On first sight I tried to be cool, not look too excited, but I was excited. I organised with the owner to have another look a week later. In the meantime I went and showed Ralph the photos, and organised my friend Anthony to fly down from Sydney and look at it with me. We agreed on a price and basically checked the oil, tyre pressures (radials thankfully) bought lots of supplies and spares and headed to Sydney. It was by this time peak hour, not the best time to drive a LHD car in a foreign city, especially a city that has trams. We planned to get to Albury on the first night, then get up early for the rest of the haul to Sydney. The emergency plan was also easy, I have a sister in Wangaratta which is only 2 hrs from Melbourne. If anything happened we could leave the car there. The Caddy went like a dream, we soon discovered a few things that didn't work. First was the fuel gauge which worked until about 1/2 a tank - we did the world's longest mercy dash coasting to the servo. We rolled for at least 2-3 kms then into the uphill driveway of a roadhouse stopping within reaching distance of the bowser. Second were the wipers, this was a little more tricky and thankfully it only rained for the last 3 hours of the trip which was in daylight. I still today live with a feeling of disbelief that the Caddy is actually ours. So many times I've driven friends' Cadillacs to events for them, but it really hit home on our first official Caddy run as a car owner. The Capital Cruise to Canberra was just so exciting for us, cruising down the highway in convoy for the first time was amazing. Everyone helped by showing us this and that about the car, everyone was so encouraging, to top things off it was an all round excellent event. On the way home we stopped at Uncle Barry's. He's an older gentleman but due to autism, it is as if he is a child. Until the day I die I will never forget his response to seeing our car for the first time. He jumped up and down clapping his hands making the most excited person on earth noises imaginable. So moved by seeing this as Roslyn and I were leaving, I burst into tears and had to pull over. Caddys and LaSalles bring joy to others. Don't ever forget that as it is a most rewarding part of owning one. Buying a Caddy was like accomplishing a dream, I feel so happy.